The Biggest Service Project to Date! These are just a few adjectives to describe our biggest service project to date! armed with work gloves, bottled water, tons of energy and an eagerness to make a difference. By 7:30am, the parking lot of Simpson-Waverly, the kick-off site for the event, was filled with vans and buses. The 311 volunteers headed straight to the auditorium post check-in for the kick-off rally that lasted approximately 30 minutes. The kick-off consisted of a praise session, songs, and prayers. The Big Day of Serving is an opportunity for youth to transform a neighborhood; it occurs nationwide during the fall and spring months. 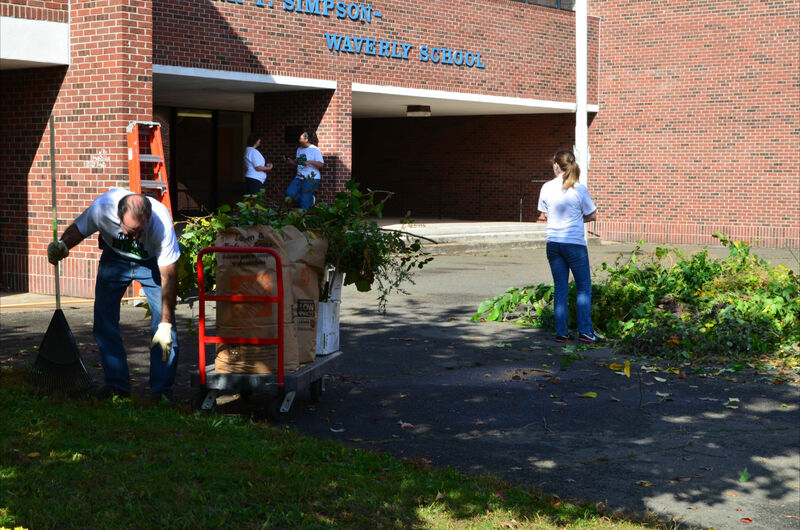 Our Big Day of Serving volunteers focused their efforts on beautifying the North End of Hartford. Their sites included: King Elementary, Weaver High, Simpson-Waverly Elementary Schools and Keney Park. 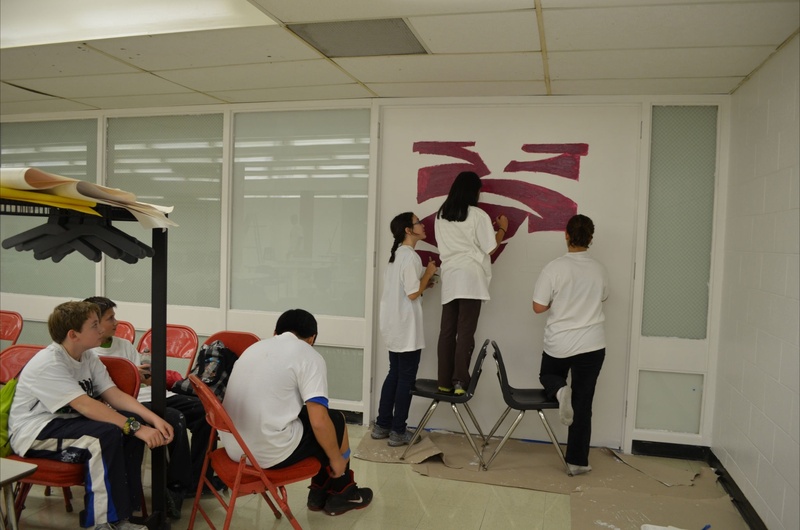 Over at King volunteers painted hallways, the cafeteria, stairwells, hand rails, door trims, planted mums, cleaned-up debris/leaves and scrubbed stairs in high traffic areas. The outdoor team at King, switched gears after lunch and walked across the street to Keney Park, the largest park in the city, to enhance the space (this was actually the first time that we worked with the Park). They planted approximately 240 tulips, pruned shrubs and removed invasive plant species. At Weaver High, volunteers gave the girls locker room a face lift (removed all traces of graffiti) and applied a fresh coat of paint. The hallway leading to the cafe was also revamped and now sparkles – the enhanced hallway now complements the handsome cafe where culinary arts students display their creations. 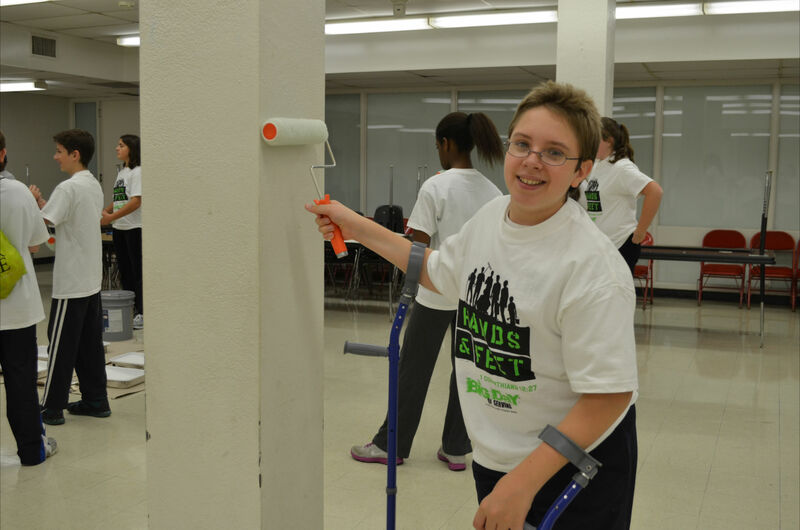 Additionally,volunteers painted the 1st & 2nd floor hallways. At the end of the service projects all of the volunteers returned to Simpson-Waverly for the celebration– which included refreshments, praise songs and reflection. It was truly a day well spent and a huge undertaking for us that proved beneficial to all involved. We enabled the revitalization of three elementary schools (and a park) in the North End – an area of Hartford that doesn’t share the same level of resources as other parts of the city. Through the management of this project, Hands On Hartford brought a value of $37,361 to the community (not including material costs) in volunteer time. But, the best part of all were the moments when the youth volunteers connected with the community children. It was truly magical and fellowship at its best. Ashleigh Eubanks is a native of Hartford and grew up in the north end. She recently graduated from Mount Holyoke College in May with a Bachelors Degree in Gender Studies and a Minor in Sociology. She hopes that her time as an Americops VISTA will help her figure out her next steps as far as grad school and future career plans. Ashleigh is very passionate about social justice issues and is committed to working with disadvantaged populations. Ashleigh is currently an Americorps VISTA member serving as a Homeless Youth Coordinator. Some of Ashleigh’s goals for this year as Homeless Youth Coordinator are to expand the overall awareness and knowledge around unaccompanied youth homelessness; form advocacy groups for youth who have experienced homelessness to make recommendations as to how to better address the issue; work with service providers to be more youth friendly and to keep in mind the unique situation of unaccompanied youth; and to identify a group of stakeholders interested in being a part of the development of a youth only shelter or drop in center. Ashleigh has a special interest in this work because about two years ago she participated in a Doctoral research project where she interviewed youth who had been unaccompanied or homeless in the past. The objective of this project was to assess the social supports and resources available to youth when they need a place to stay. As a researcher on this project most of the people that Ashleigh interviewed were her friends and peers. Ashleigh is in the process now of organizing a Panel Discussion on Unaccompanied Youth Homelessness in Hartford. The panel will discuss the issue of youth homelessness in Hartford and why these youth are often referred to as an “invisible population”. This event is free and open to the public. It will take place in the CCC room at Downtown Hartford Public Library on Tuesday November 13th from 4:30-6:30 p.m. Refreshments will be served.